Top reasons to use Cinnamon donkey milk soap for skin, hair and body. What are the benefits of cinnamon for your skin? Why cinnamon helps your hair health? Why is Cinnamon So Good for You? Did you know that cinnamon donkey milk soap is perfect for your skin, hair and body? Have you ever used cinnamon donkey milk soap? Do you know that your skin can love cinnamon donkey milk soap? Cinnamon is a spice obtained from the inner bark of the tree genus Cinnamomum. Cinnamon has been used for centuries in Chinese food and medicine to cure main ailments like cancer, flu, and indigestion. Cinnamon contains fiber, manganese, calcium, and iron and is commonly used in many food dishes. What not many people know is that cinnamon also possesses properties to cure many skin, health, and hair problems. Cinnamon contains antimicrobial properties that can benefit the skin. What are the Cinnamon donkey milk soap benefits for skin, hair and body? Cinnamon donkey milk soap benefits for your skin. 1. Cinnamon helps to Cure Acne, Pimples, and Blemishes. Cinnamon donkey milk soap helps get rid of acne and pimples on the face and body. This is done by drying the skin and bringing blood and oxygen to the outer skin surface. 2. Cinnamon soothes dry Skin. Cinnamon helps remove dead skin cells and helps restore shine and suppleness to the skin. Cinnamon donkey milk soap which contains also olive oil, castor oil and coconut oil fights skin dryness. 3. Cinnamon as Complexion Enhancer. Thanks to the antifungal and antibacterial properties, cinnamon helps enhance the complexion. Cinnamon donkey milk soap may be relieves also Eczema. Cinnamon improves blood flow and brings the oxygen and blood to the outer surface of the skin, and this causes minor plumping and a fuller complexion. 5. Cinnamon Prevents Skin Infections and helps to Cure Cuts and Wounds. For any kind of skin infection, cuts and wounds use regularly cinnamon donkey milk soap by applying it to the affected areas. Cinnamon is also known that helps to cure ringworms. Cinnamon donkey milk soap benefits for your hair. 6. Cinnamon Stimulates Hair Growth and strongness. It is well known since ancient times, that cinnamon has been a valued spice for making hair strong and beautiful. Cinnamon ensures enhanced blood circulation in the body, which ensures hair roots and scalp to get the required nutrition, and oxygen, which leads to strong, beautiful and healthy hair. 7. Cinnamon as Scalp Cleanser. Cinnamon nourishes the scalp by acting like an exfoliator. When Cinnamon donkey milk soap is used every day onto the scalp will stimulate the cleaning. 8. Cinnamon Lightens Hair Color. Cinnamon has been shown to help lighten the hair color. There for use every day Cinnamon donkey milk soap! 9. Can Cinnamon donkey milk soap may be Prevents skin’s Cancer? Skin Cancer is a serious disease, characterized by uncontrolled growth of cells. Cinnamon’s high concentration of antioxidants can help protect the body from damage from free radicals and reduce inflammation, reducing risk of cancer and other diseases. The combination of cinnamaldehyde, antioxidants and cinnamon’s high fiber content are some of the characteristics that lend it its incredible positive effects on the human body. As Cinnamon contains anti-cancer properties can Cinnamon donkey milk soap prevent skin cancer? Further studies will prove that! 10. Cinnamon Reduces signs of aging. As we are growing up collagen in our skin starts to break down, leading to signs of ageing. For when you might need it, cinnamon and donkey milk in soap can increase collagen production, and can thus slow down the appearance of fine lines and wrinkles. It also stimulates blood vessels and increases blood circulation in your face and skin. You can use cinnamon donkey milk soap for skin whitening. It can visibly brighten skin. 12. Cinnamon donkey milk soap for acne and eczema. You can may be treat acne even pimples and eczema with donkey milk soap! Try it why not? Why El Greco handmade Natural Cosmetics soap with cinnamon? It is our desire that you are informed what you’re getting when considering El Greco handmade Natural soap. Our products are made with natural organic ingredients so you don’t have to wonder about the integrity of the soap your body is absorbing. This is important because what you apply to your skin invariably winds up in your blood! The fact is, chemicals absorbed through the skin go straight to the blood-stream and are carried off to the rest of your body (liver). They don’t get filtered and broken down in your stomach like your food does. Handmade natural soaps from El Greco Cosmetics range are made with rare and valuable natural raw materials such as organic Donkey Milk. This as key ingredient acts in synergy with the amazing properties of olive oil, coconut oil, palm oil and castor oil in order to leave the skin clean, smooth, nourished and moisturized the most sensitive skins. Handmade soaps from El Greco Cosmetics are slightly scented with essential oils which bring their own natural properties or they have a more fragrant aroma. El Greco Cosmetics soaps give a fine, creamy and smooth foam suitable especially for face cleansing and body. They can also be suitable to shave the face and the body. They can help prevent shaving irritations. The ingredients are mixed at low temperature, so the quality and features of components will not be compromised. Processing is carried out in the open air tanks, while the soaps are constantly monitored and stirred in order to obtain a uniform mixture. The mixture will be poured into wooden forms, thanks to which the warmth will be removed gradually. Soaps dry in the wooden forms 96 hours, then cut into sticks with different weights and packaged. With this method of production develops natural glycerin, which makes the soap soft, sparkling, rich and soothing- making it suitable for every skin type. Preservative – free soaps. No color additives. El Greco Cosmetics will take care of your skin leaving it supple and radiant. Our cosmetics are dedicated to every skin type, especially dry and sensitive skins. They will give a silky finish and a velvet touch to your skin wrapping you with a fresh and delicate fragrance. The cream that is present in donkey milk in our handmade Natural soap with donkey milk helps boost the moisturizing quality of donkey milk soaps. Our handmade natural soap with donkey milk will not dry your skin out like much other soap. This is important because keeping skin naturally moisturized helps keep skin healthy. Reasons of using natural donkey milk soap. The cream present in our handmade natural soap with donkey milk is not just a moisturizer, soothing dry and damaged skin, but possesses an anti-inflammatory effect. Donkey milk is effective for treating acne primarily because it has anti-bacterial properties that delay the growth of microbial organisms that spur the spread of acne. Also helps in treating other skin conditions such as eczema and psoriasis. Donkey milk in our handmade natural soap has been used as a beauty treatment for thousands of years to hydrate skin, heal and soothe the skin and promote skin renewal. Donkey milk in natural Donkey milk soap also delays visible signs of aging like fine lines and appearance of wrinkles. We at El Greco Cosmetics based on our own experience recommend our donkey milk soaps for all skin types. Use El Greco Cosmetics Donkey milk soap on your face and body with water. Work into lather for effective cleansing and for an aroma-therapeutic benefit. You can rest assured that all our products are made with 100% natural ingredients, free from parabens, sulfates, petrochemicals and synthetic colorants and fragrances. So not only they look good and smell beautiful, but more importantly good for you! Putting together the benefits of donkey milk and vegetable oils we made the perfect soap bar for your skin body and hair with all anti-aging skin benefits. For a cosmetic to be a genuine organic natural product, at least 95% of its ingredients must be natural. In addition, these ingredients must be extracted using natural methods and subjected to minimum processing. We handcraft our Natural organic soaps using the slow cold process method, which means no external heat is used to the goodness of the natural ingredients are preserved for you as much as possible. Each bar of our Natural Organic soap begins with Donkey milk as key ingredient, a high percentage of nutrient-rich organic extra virgin olive oil, for its well-known superior skin care properties, to which we add organic coconut oil for fluffy lather, sustainable organic palm oil to increase longevity, and organic castor oil for a dense creamy lather that conditions and moisturizes. El Greco Cosmetics Natural soaps have a natural alluring aphrodisiac aroma. They get their color and the aroma of the natural ingredients we add in such as lavender, oatmeal, Curcuma, and honey. Other than that they also reduce muscle stiffness, sprains & other physical aches. 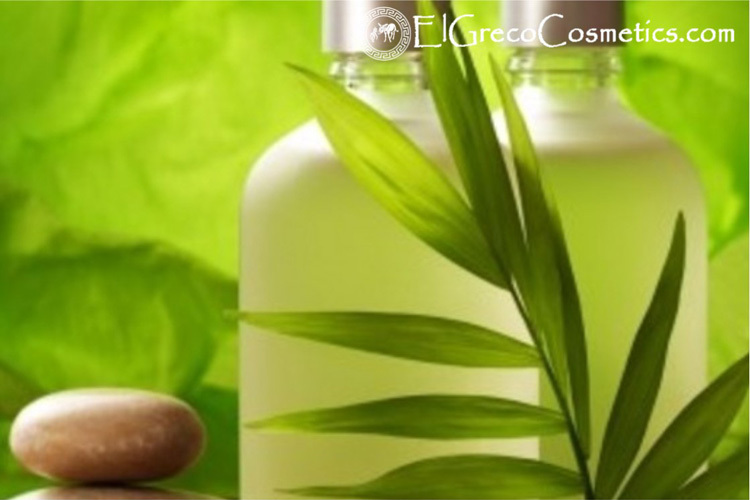 El Greco Cosmetics Natural Organic soaps improve skin elasticity, helping to reduce the visibility of scars & stretch marks. El Greco Cosmetics Natural Organic soaps leave your skin gently cleansed & lightly perfumed as you leave the bath. El Greco Cosmetic’s Natural Organic soaps are used to reduce greasy skin, while soothing dry, sensitive & irritated skin. Get relaxed and tension free by using El Greco Cosmetic’s soaps. Are you ready to use El Greco Cosmetic’s Organic Donkey milk soaps for your skin, hair and all your body? The only thing you need to do to get started is to visit our website and buy some straight from our webshop. Using Natural Organic soap is a convenient way to treat your skin to all of its miraculous benefits. Our donkey milk soaps are handcrafted using fresh milk from the donkeys of our farm. How can you use Donkey’s milk soap? …Lather soap onto hands or a washcloth and apply to your face and body. For centuries the wonderful properties of natural organic donkey milk soap have been known, praised, experienced and enjoyed. Isn’t it about time you started enjoying these benefits too? The best way to find out is to put it to the test! Purchase some bars of our handmade natural organic oatmeal donkey milk soaps, or Curcuma Natural organic donkey milk soaps, or lavender Natural organic donkey milk soaps or Honey Natural organic donkey milk soaps or our pure natural organic Donkey milk soaps, which are all with coconut oil, olive oil, palm oil and castor oil, from our e-shop of our website and give them a try. I can assure you, the experience will be well worth it. you will get all organic donkey milk soap with castor oil benefits. We are sending our handmade natural soaps free of post-charge worldwide if your purchase is €50 or more. You Read Our Whole Blog Article! Yeah!! Your New-found Education Has Gifted you an additional Coupon Good for 30% off on Your first Entire Order! Use your coupon at checkout. Did you find this article helpful? Feel free to like and share it on social media by using the buttons below. Find out more about cinnamon donkey milk soap. THE TOP 5 REASONS TO SWITCH FROM CONVENTIONAL COSMETICS TO ORGANIC COSMETICS! 10 AMAZING BENEFITS OF ORGANIC COSMETICS FOR YOUR BEAUTY! TIPS OM JE EZELINNENMELK ZEEP LANGER TE BEWAREN! WHAT ARE THE BEAUTY BENEFITS OF USING ORGANIC DONKEY MILK COSMETICS? Top 10 amazing benefits of cinnamon Donkey milk soap for your everyday’ s beauty! ΓΙΑΤΊ ΝΑ ΠΡΟΤΙΜΉΣΕΤΕ ΣΑΠΟΎΝΙ ΜΕ ΓΆΛΑ ΓΑΪΔΟΎΡΑΣ ΚΑΙ ΚΑΝΈΛΑ? 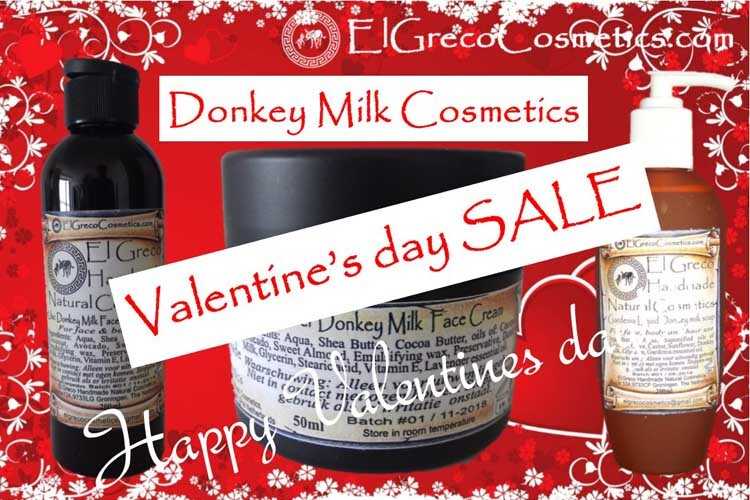 Donkey milk Cosmetics the perfect Valentine’s Day gift.